The roots of Dickinson’s Bluegrass on the Grass Festival can be traced to bluegrass barn parties on the farm of Davis Tracy, former Director of the Dickinson College Counseling Center and popular DJ of the Bluegrass @ Dickinson WDCV 88.3 radio show (8 AM on most Mondays, Wednesdays and Fridays). At one of these gatherings Davis had bluegrass pioneers Hazel Dickens and Alice Gerrard play and his Dickinson colleagues were so impressed that they thought it would be a good idea to have a summer bluegrass concert on campus. 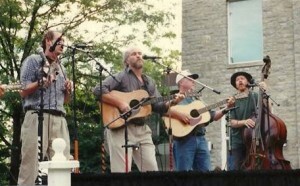 In July 1996 on the lawn beside the Weiss Center for Performing Arts, Davis and his band, Country Bob and the Barbeque Boys, along with the Penn-Del Mountain Boys and the Fox Family, took the stage and performed to a crowd of about 200. After its debut, the festival quickly grew in size and eventually moved to the academic quad in front of Bosler Hall and the historic Old West building. Today, the festival is a regional event drawing more than 4,000 music enthusiasts. 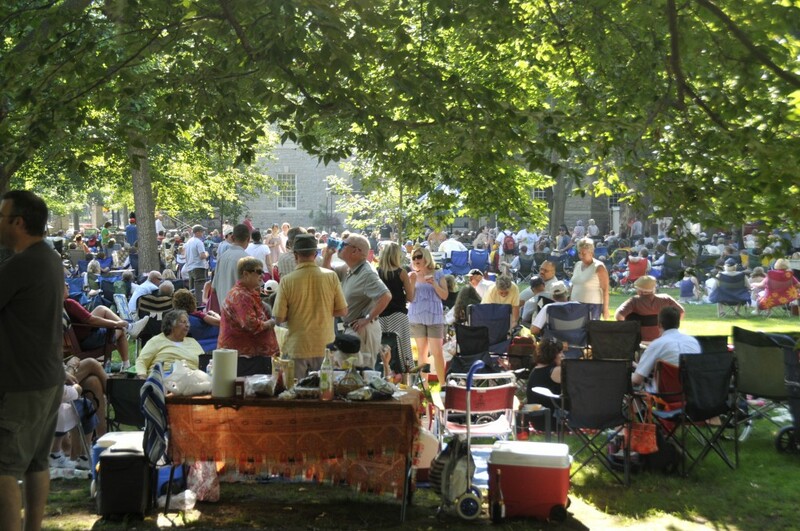 Bluegrass on the Grass is known for having a diverse mix of artists ranging from traditional bluegrass, olde time music, and “new” bluegrass. Since its initial festival, The Dismembered Tennesseans have been a regular staple the festival. Bluegrass on the Grass has showcased a number of major bluegrass acts over the years such as Lynn Morris (International Bluegrass Music Association 1996 Song of the Year), Blue Highway (IBMA 2008 Song of the Year), Butch Baldassari & Mike Bubb (2008 IBMA bass player of the year), Dale Ann Bradley (2009 IBMA female vocalist of the year), The Claire Lynch Band (2010 IBMA Female Vocalist of the Year), Junior Sisk & Ramblers Choice (IBMA 2013 Male Vocalist of the Year), the Steep Canyon Rangers (2013 Grammy for Best Bluegrass Album), Frank Solivan & Dirty Kitchen (2014 IBMA Instrumental Group of the Year), Special Consensus (2014 IBMA Recorded Event of the Year), Michael Cleveland & Flamekeeper (three time IBMA Instrumental Group of the Year), The Boxcars (three time IBMA Instrumental Group of the Year), and Russell Moore & IIIrd Tyme Out (five time IBMA Male Vocalist of the Year). This non-profit festival is organized by volunteers and Dickinson College hosts the festival, provides annual seed funding, and provides substantial logistical support for the event. Other contributions come from more than 200 private donors, who are listed in the back of the annual program, Carlisle-area businesses that have purchased program advertisements, vendors that sell food and drinks the day of the festival, and sponsor-ticket sales the day of the event. These contributions, along with volunteers, enable this non-profit event to be realized every year and allow organizers to pay the bluegrass musicians, provide them with first-class housing, and feed them during the festival. Furthermore, record companies that represent the performers support Bluegrass on the Grass by donating music CDs to be given away annually to festival attendees who purchase sponsor tickets. Record companies that have supported the festival include Rebel Records, Rounder Records, Sugar Hill Records, Acoustic Disc Records, Pinecastle Records, Copper Creek Records, Mountain Roads Records, YepRoc Records, Patuxent Music, and Rural Rhythm Records. Finally, the Martin Guitar Company of Nazareth, Pennsylvania has been a long-term partner of the Bluegrass on the Grass Festival by donating one of its guitars to a lucky sponsor-ticket holder. Check out our list of past festival performers!